Bulk packaging-12 funny wind up toys included. With a rose in the mouth of each clockwork teeth toy, it is very interesting to see. Easy to Use-Just rotate the clockwork spring. 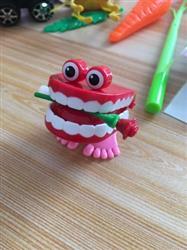 Funny clockwork teeth toys will keep chattering and babbling for a while. They are pretty small and fit comfortably in the palm of your hand, so even little guys can easily wind them up. Happy Memories-It is funny to watch these little things jumping around all at once while kids laugh and knock each others over. Packaging- This clockwork toy set is packaged in a high quality colorful paper box, and will arrive in perfect condition. Warning:Not suitable for kids under 3 years. package includes 12 funny teeth wind up toys. Just rotate the handle and toys will start chomping and babbling. Suitable for kids 3 year and up. Very interesting! Proloso toys are designed for your taste, bringing you endless fun. Low shipping fee and premium service ensure the best shopping experience for you. Warning:Not suitable for kids under 3 years. This toy is made up of small pieces which could be swalloowed and/or inhaled. It is composed of elements that can be dangerous if used in an incorrect way by children. Better for kids to play under adult supervision. ❤️ Welcome to our shop! Have a good time! Ordered this set as a present for my students. Kids really love this toys. Every kid deserves rewards from their good performances. Will order other bulk goods toys again, such a nice online shop. The goods were traced all the way. Packaged well. The seller put a gift.